347) Eaten by Cannibals? No Problem. In 1606 a chain of eighty islands in the South Pacific was discovered by Fernandez de Quiros of Spain. In 1773, the islands were explored by Captain James Cook who named them ‘New Hebrides’ because of the similarities with the Hebrides Islands off the Northwest coast of Scotland. In 1980, the New Hebrides gained its independence from Britain and France and was named Vanuatu. The population today is about 190,000. To the best of our knowledge, the New Hebrides had no Christian influence before John Williams and James Harris from the London Missionary Society landed in 1839. Both of these missionaries were killed and eaten by cannibals on the island of Erromanga on November 20 of that year, only minutes after going ashore, and in full view of the crew of the ship that had just dropped them off. On April 16, 1858, John Paton and his wife Mary sailed for the New Hebrides, arriving at the island of Tanna on November 5. In March of the next year both Mary and their newborn son died of ‘the fever.’ Paton then served alone on the island for the next four years under incredible circumstances of constant danger, until he was driven off the island in February, 1862. For the next four years Paton did mobilization work for the Presbyterian mission to the New Hebrides, travelling around Australia and Great Britain. He married again in 1864. In 1866 he and his wife Margaret went back to New Hebrides, this time to the smaller island of Aniwa. They labored together for 41 years, until Margaret died in 1905. 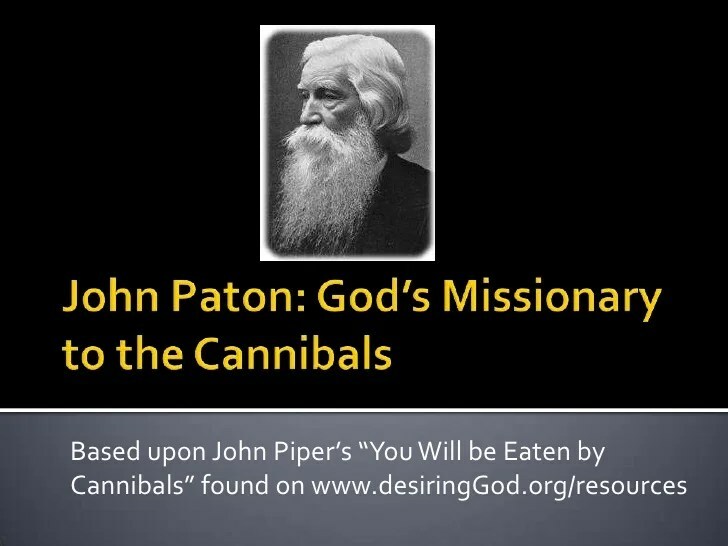 Paton admitted that at times his heart wavered as he wondered whether these people could be brought to the point of weaving Christian ideas into their lives. But he took heart from the power of the gospel and from the fact that thousands on the island of Aneityum had come to Christ. Paton learned the language and reduced it to writing. He built orphanages and schools. They “trained teachers, translated and printed and expounded the Scriptures, ministered to the sick and dying, dispensed medicines every day, and taught them the use of tools.” They held worship services every Lord’s Day and sent native teachers to all the villages to preach the gospel. In the next fifteen years, John and Margaret Paton saw the entire island of Aniwa turn to Christ. Paton published the New Testament in the Aniwan Language in 1897. Even to his death he was translating hymns and catechisms and creating a dictionary for his people for when he could not be with them any more. Today, about 85% of the population of Vanuatu identifies itself as Christian. Psalm 65:5 — You answer us with awesome and righteous deeds, God our Savior, the hope of all the ends of the earth and of the farthest seas.